Notes:Fits models with manual transmission only. 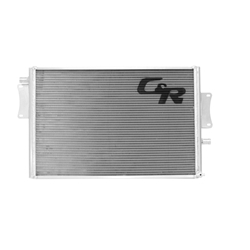 C&R Racing Chevrolet Camaro ZL1 heat exchangers are engineered to end dreaded heat soak, which robs major horsepower from the engine. The heat exchangers use a close center tube core to reduce intake temperatures allowing for more timing and increased boost pressure over the stock unit. These heat exchangers bolt into the stock locations and use the factory hoses.